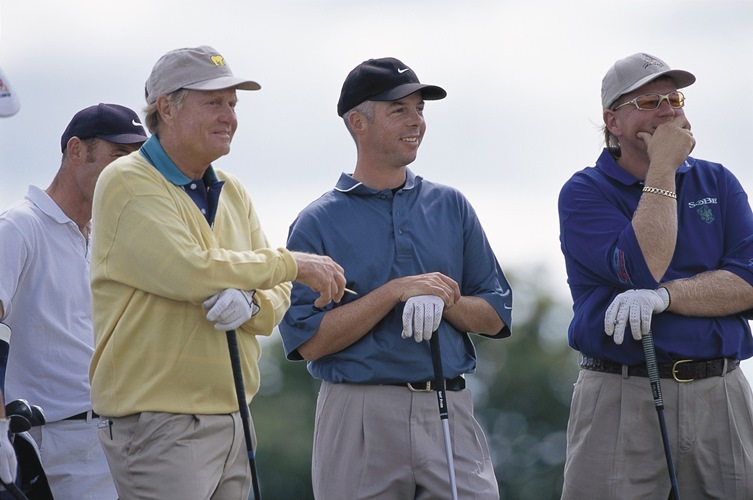 University Golf Coach Dean Robertson flanked by Jack Nicklaus and John Daly at The Open in 2000. Photo: Keith Campbell. University of Stirling Golf Coach Dean Robertson is used to success, having led his students to become European University champions and soar up the World Amateur Golf rankings. Two Stirling graduates were part of the Scottish side to win the European Amateur Team Championship title at the weekend in Sweden, the latest in a series of stunning results under Dean’s tutelage, which also includes Curtis Cup and Walker Cup call-ups. But is it any wonder when Dean himself can recall past performances over a decade as a European Tour professional. This week is extra special for the gifted golf coach, as Dean made the cut in both his Old Course outings at The Open and even played with past champions Jack Nicklaus and John Daly. So who better to call upon for the inside-line on what faces the 156 players when they step onto the first tee at St Andrews tomorrow (16 July). Dean played in four Open Championships during his professional career, including at St Andrews in 1995 and in 2000, the latter seeing him finish 26th. “The Open is an unbelievable tournament to play and when it’s at St Andrews it brings an even greater level of excitement,” said Dean, who now leads the high performance golf programme at Stirling, Scotland’s University for Sporting Excellence. “Fans come from all over the world to watch and I found myself being a player and a spectator at the same time. St Andrews is iconic and playing the starting and finishing holes are as fantastic as you expect them to be. I still get goosebumps just thinking about it. The 144th Open sees six Scots competing, including 2007 BA Hons Marketing and Sport graduate Richie Ramsay. Richie makes his fifth Open Championship appearance; his debut coming after he won the 2006 US Amateur Championship. Another former Stirling student with an affinity to the Old Course is Gordon Sherry. The 1996 BSc Biochemistry graduate played in 1995 whilst still a student, catching the eye with a hole-in-one during a practice round. For more about the high performance golf programme at the University of Stirling.